Keeping your computer skills up to date can be a real challenge for many people with a visual impairment. 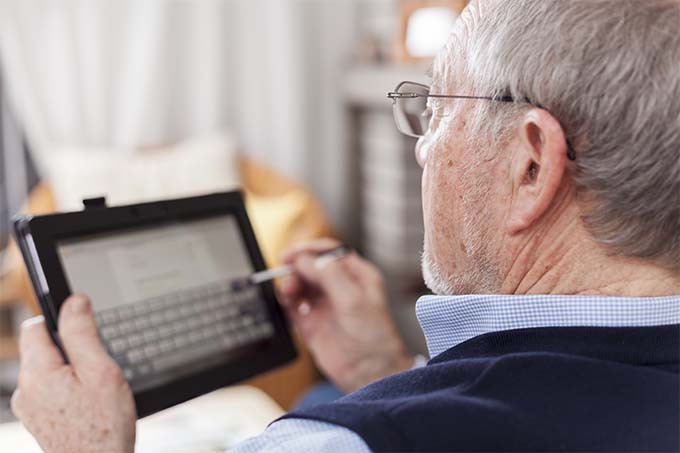 At NCBA, we provide training using specialist software that can promote your sense of independence and confidence in staying connected. Our computer training classes can help you get to grips with your computer and show you how you can connect to the wider world through the internet, skype and social media. A participant who attended the training said: “This course has been really useful – I’ve learned a huge amount and now feel much more confident in using Supernova software and being able to use it more effectively in my work setting”. Jenny Stewart, IT trainer said: "It was very rewarding seeing everyone's confidence increase during the course and being able to answer questions that have been holding participants back". Our knowledgeable and friendly IT trainer can help you make the most of your existing skills, or support you in learning new skills, but whatever your abilities we can help you make the most of today’s technology. In the classes you will learn how to send an email, navigate between websites, and how to organise files and folders and much more. We will be using Dolphin Guide and Supernova magnification/screen reading software as part of the training. Using a computer can be easier than you think and age isn’t a barrier to learning new skills. To book your place on our next course, please get in touch. There are lots of ways to volunteer with the Northumberland County Blind Association. From distributing collection boxes, to joining our home visiting service, to becoming a member of our board of trustees, there's something for everyone. Find out more here.